How important is a good valve seat job? If you ask any high performance engine builder he will tell you the impor­tance of having a good valve job. After all, every bit of the precious air/fuel mixture must pass by, over and around the valve area, going into and out of the cylinders. In recent years there has been a trend towards the main area of engine failure being cylinder head related. Modern power units have greatly improved outputs in relation to their capacities, largely achieved through improvements in the fuel supply system, valves, exhausts and with the addition of turbos and more recently superchargers to many engines. Combined with lower emissions achieved by leaner burning, plus thinner castings to improve efficiency and warm up times the modern cylinder head gets a very hard time. While these developments are good for the consumer, they place huge demands upon the valve train components. Also, since the introduction of low lead petrol and low sulphur diesel, the cylinder head has once more become the main target for attack, especially within the older designs of engine which were not originally developed with all this in mind. The cylinder head is the heart of any engine with power outputs being directly attributable to breathing efficiency. No-one is more aware of this fact than us, which is why we have invested in specialist machinery to aid the business of cylinder head machining. 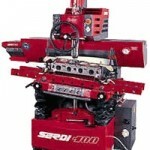 After initial inspection and cleaning your cylinder head is transferred to our Serdi 100 valve seat machining centre for valve seat machining plus and any valve guide re-sleeving or seat insert replacement that might be required. 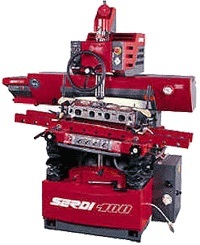 Serdi use a combination of a work head which floats on air and a spherical air cushion within the work head to permit total spindle movement in any plane, freely allowing the pilot to find the exact axis of the valve guide bore. 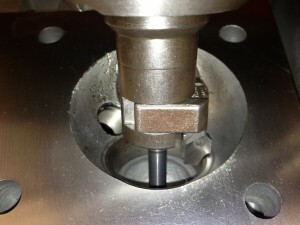 Using parallel ground carbide pilots (available in 0.1mm increments to give the best possible fit), the machine centres itself within the valve guide bore. Once centred the spindle is locked in position the valve seat is ready for machining. Our Serdi 100 is equipped with a vast range of multi angle carbide form cutters mounted in adjustable tool-holders used to set the valve seat diameters. Any form may be selected from the range to produce the required seat angles. At H T Howard we use a minimum of three angles on each valve seat. Multi angle valve seats can be produced consistently and accurately at the ideal position on the valve and repeated perfectly for each valve seat to maintain a perfect gas tight seal. Each valve seat then has the same diameter and width as the last to aid the smooth running of any engine. Valve heights can also be set for the increased demands of high performance engines, helping to balance the compression ratio between cylinders. This is especially important on many diesel engines for maximum efficiency. The valve seat is left with the perfect profile and contact area between itself and its valve to aid heat dissipation, helping to restore or even improve on the original engine performance. Heat transfer from the valve to the head requires precise contact with the seat. A concentric valve job means cooler running valves and longer life. The valve seat has an effect on air flow and ultimately engine performance. All these improvements directly relate to gains in performance and efficiency. In fact, it has been proven that most increases in performance from gas flowed cylinder heads are gained from the valve seat and throat areas. 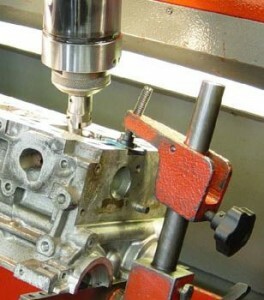 Using the correct combination of angles it is easily possible to improve the gas flow through the cylinder head. At H T Howard, we do this as part of our standard service giving extra flow at no additional cost.